- Left click any part of the screen to move Eymerich to that point. - Double click exits to leave a scene instantly (doesn't always work). 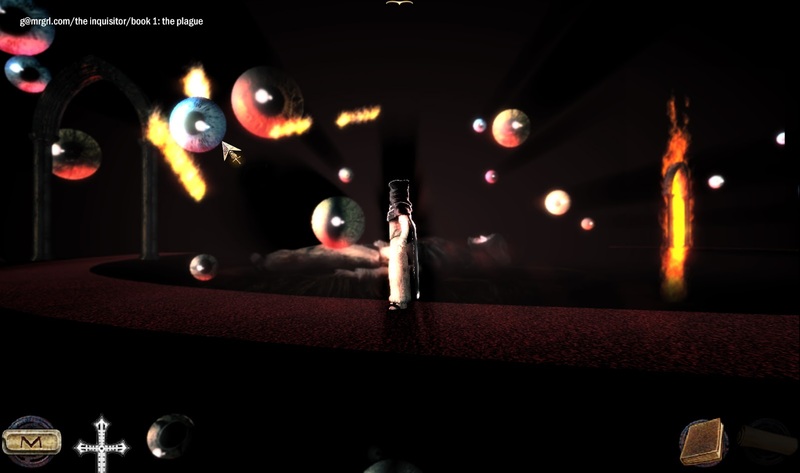 - Left click interacts with an object by popping up usage options. - Depending on the object, you can LOOK AT and/or USE / OPEN / TALK to it. - Some conversations offer dialogue options. - Unwanted comments may end conversations - but without any consequence. - Left click during a dialogue to skip it. 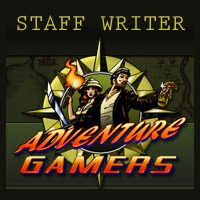 - Eymerich's objectives and notes are jotted in his diary. - Eymerich's notes are drawn sequentially even if you don't progress in order. This may result in blank pages in the diary. - The inventory is opened by clicking the icon at the top middle of the screen. - The cross (Hand Of God) is a hint mechanism that auto-executes the next task. 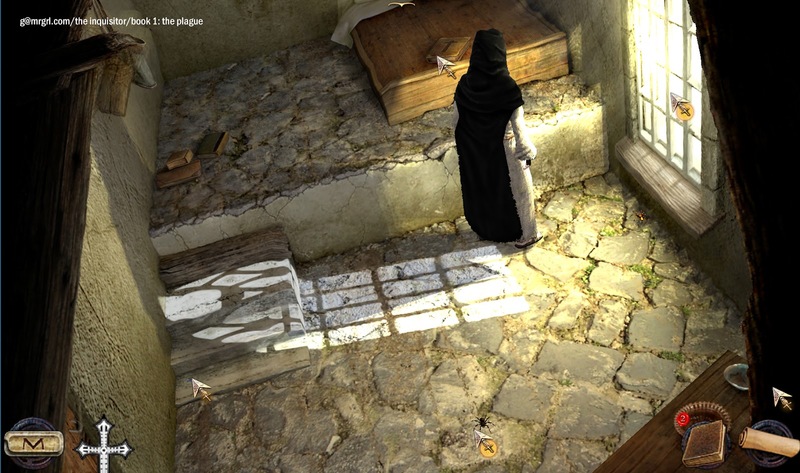 - After some time, a MAP of the abbey is available. 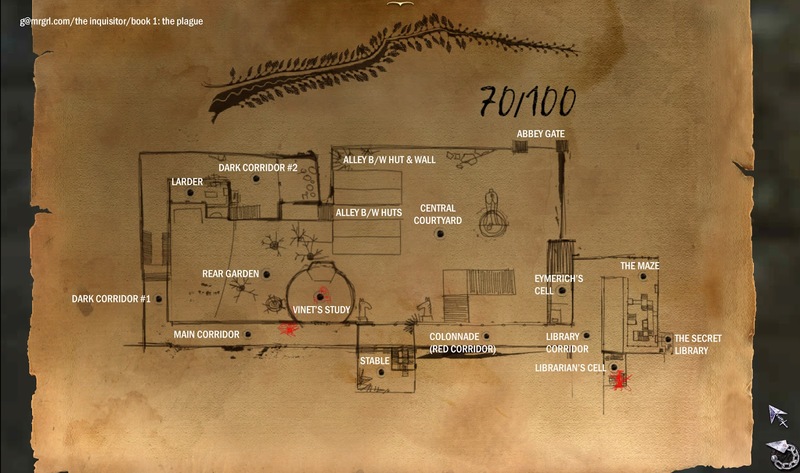 - The map is expanded as Eymerich explores the abbey. 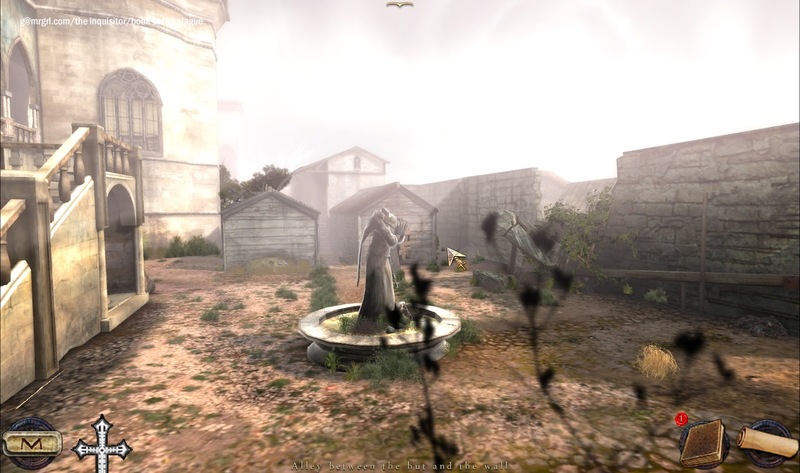 - Left click on areas marked with a door on the map to teleport there. - Some minigames are timed. Others involve extreme pixel-hunting / trial & error. 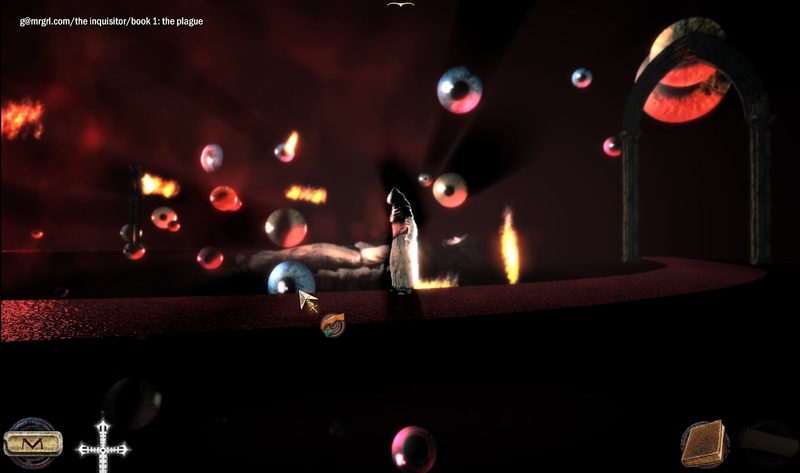 - Exiting a minigame scene resets the minigame. 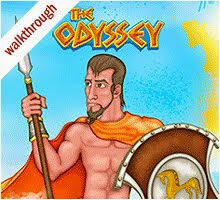 - Doing key actions and finding Easter Eggs add +1 points to your tally. - Total points are 100 - displayed on the map. - Using the Hand Of God reduces your points by -1 per use. - Press 'ESC' (or the M icon) to bring up the menu. - There are 10 save slots. 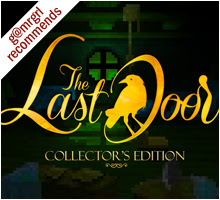 - Save OFTEN as the game tends to crash, esp in windowed mode. 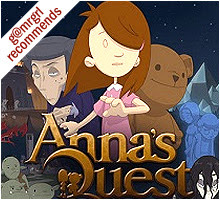 - This is not a linear game and you CAN do certain activities out of order. 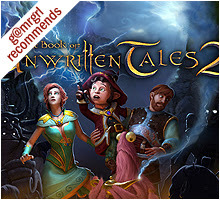 - This is a buggy game and many problems arise out of script problems and poor handling. - Objects cannot (always) be collected till there is a reason to do so. - There is a fair amount of pixel-hunting for small objects like stones. - Sometime screen perspectives change and can get you 'stuck'. - Some screens need multiple attempts to activate hotspots. - There is no way to reveal all hotspots. 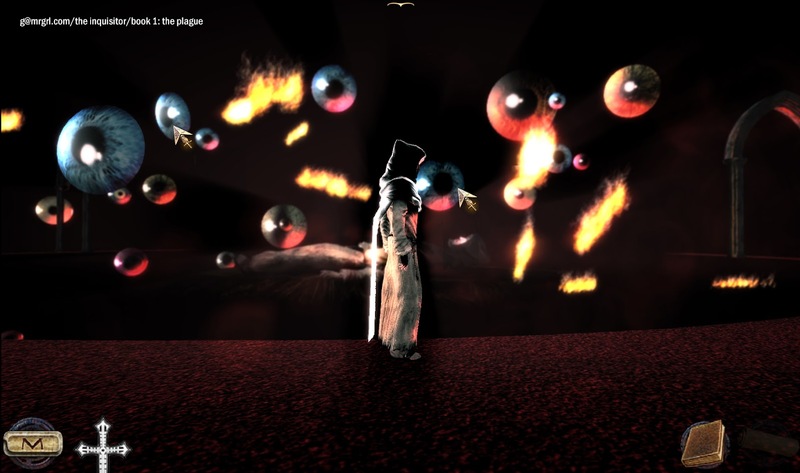 - TAB cycles through ALL interactive spots on-screen, even unmarked ones. 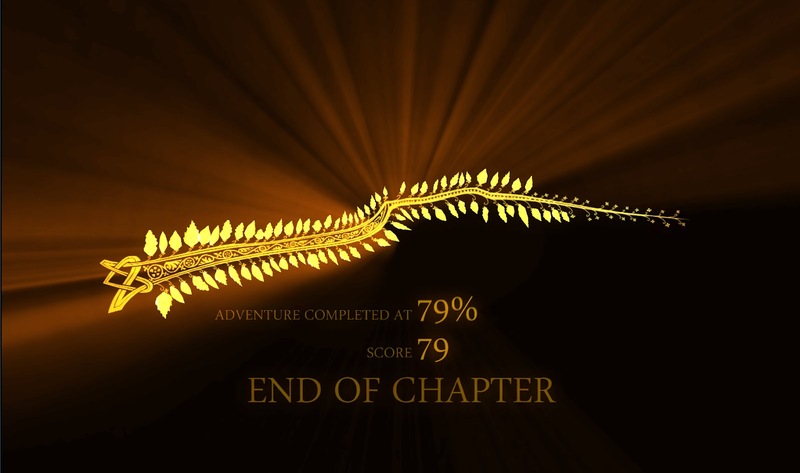 MY FINAL SCORE: 79% i.e. 79/100. NOTE the lion's head decoration - for later. 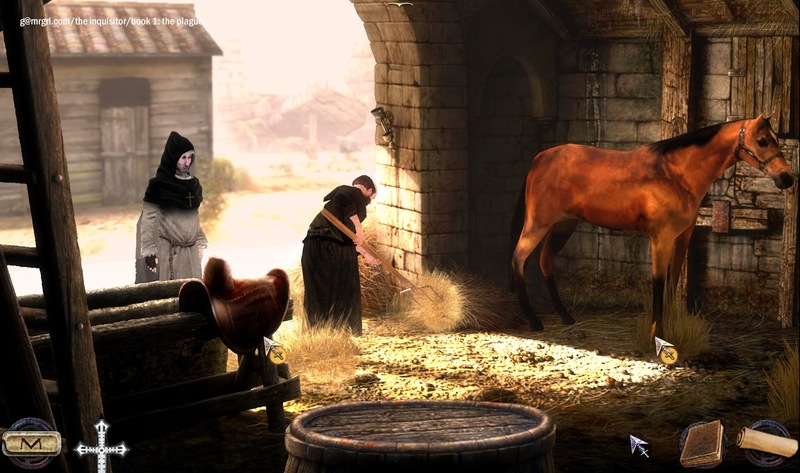 NEW OBJECTIVE: Find a stable, get a horse to ride to Calcares. WALK left to the corridor with the cross. LOOK at the hole in the wall between the stairs. 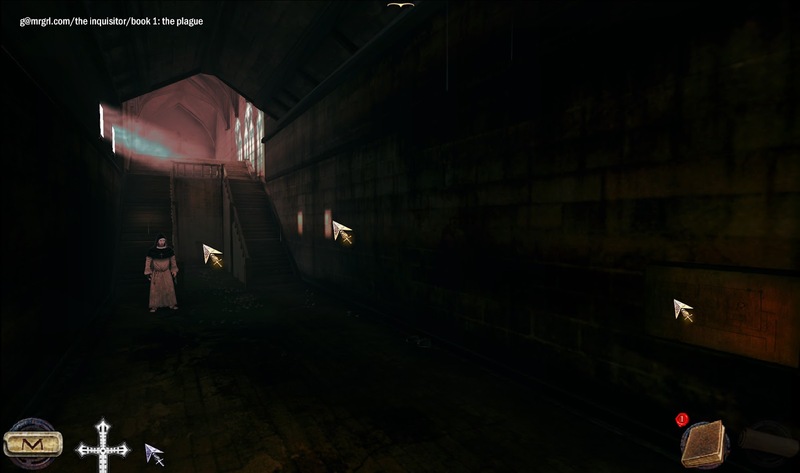 EASTER EGG: Click the crack in the stones on right wall: developer logo. LOOK at the symbols on the right wall. 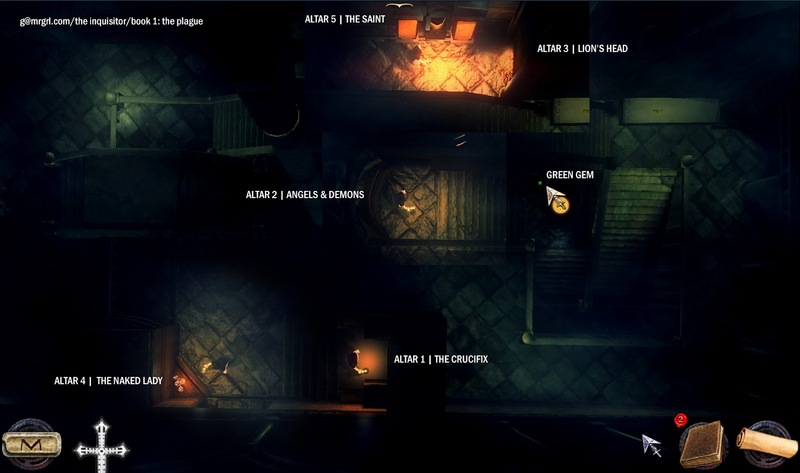 The MAP is added to the onscreen icons. EXIT left to dark corridor #2. TAKE the red gem at the right, near the wall. TAKE the pulley behind the red gem. TAKE the yellow gem at the left, near the woodpile. TAKE the blue gem from the first log of the woodpile. WALK to the back of the corridor (front of the screen). TAKE the yellow gem beside the pot at right, near the door. TAKE the rainbow gem beside the small pot. TAKE the blue-green gem from the large bowl at right. EXIT right to the larder. TAKE the rag / cloth above the sink. 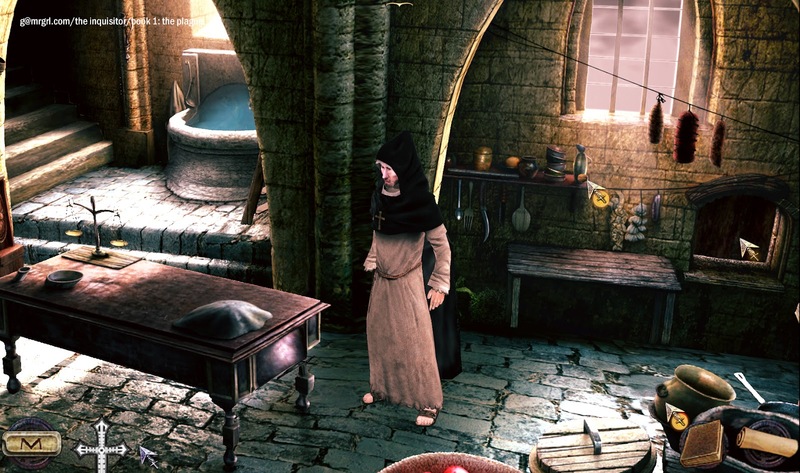 TAKE the metal item on the sideboard at left. TAKE the pocket knife from the table. TAKE the bottle of wine from the table at the foot of the screen. LIFT the silver jug / crockery next to the green bottle on the table. TAKE the hexagonal piece of metal from under the jug. NOTE the bread on the table - for later. NOTE the closed hatch at the right of the bread - for later. WALK to the right side of the larder. NOTE the walnut on the shelf on the rear wall - for later. LIFT the brass pot / crockery at bottom right. TAKE the triangular piece of metal under the brass pot. NOTE the door in the rear wall - for later. WALK between the two buildings to the central courtyard. WALK to the rear left to the stables. NOTE the squirrel on the roof. WALK left to the stable. TAKE the saddle from the stand at left. It has a broken strap. TALK to the stableman about the saddle. TALK to the stableman again about Calcares. EASTER EGG: TAKE the rubber chicken behind the horse's front leg. EASTER EGG: In the INVENTORY, use rubber chicken with pulley (reference to Monkey Island I). NEW OBJECTIVE: Consult notes about demon with flaming hair. WALK to the right side of the stable. TAKE the strong rope hanging from the pillar. WALK upstairs to the colonnade. TALK to the servants at left. Repeat thrice till the leave. NEW OBJECTIVE: Get a vision of Goddess Diana in the sky. NOTE the tapestry on the right - for later. WALK to the back of the corridor, turn right to library corridor. 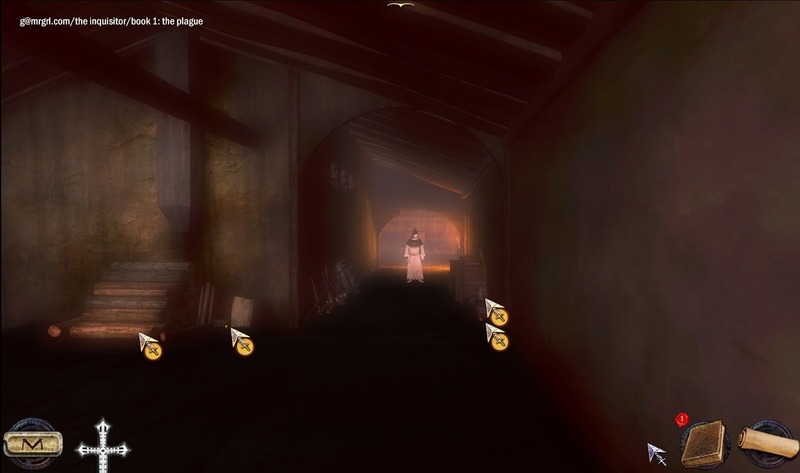 WALK to Eymerich's cell, at rear left. STEP ON the spider to kill it. EASTER EGG: CLICK the developer logo on the lowest step of the bed area. USE CLOSE UP VIEW on Eymerich's notes on the bed. 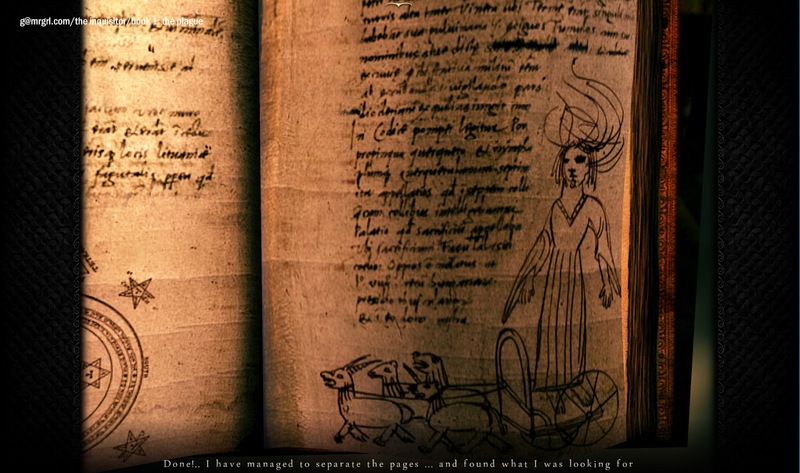 The notes are added to Eymerich's diary for future reference. NOTE the window with the polished glass - for later. NEW OBJECTIVE: Tell Abbot Vinet about the demon. EXIT the room. WALK LEFT to the colonnade. WALK straight down the colonnade. TALK to Abbot Vinet (twice). NEW OBJECTIVE: Find 'Homer's Euleusinian Mysteries' in the library. TELEPORT to the library corridor. ENTER the librarian's cell at bottom right. EASTER EGG: CLICK the skull in the left bookshelf for a quote. EASTER EGG: CLICK the special book (third row from top, middle section of bookshelf) for a photo. EASTER EGG: CLICK the parchment on rear right wall for a name 'Don Zaucker'. TALK to the librarian. He does not have Homer's book. NEW OBJECTIVE: Talk to Abbot Vinet. EXIT to the corridor. WALK to Vinet's study. It is closed. NEW OBJECTIVE: Find the Secret Library of Carcassonne. 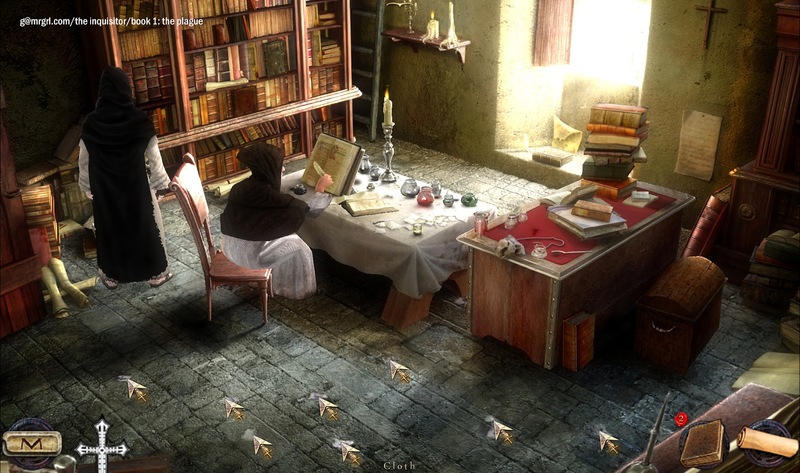 TELEPORT to the librarian's cell. USE CLOSE UP VIEW on the antiphonary. CLICK on the symbol at the bottom right corner of the antiphonary. It is in a forbidden language. TALK to the librarian again. NEW OBJECTIVE: Clean up the library. NEW OBJECTIVE: Put the cloth fragments back together. EXIT to the corridor. WALK to Eymerich's cell. USE CLOSE UP VIEW on the window. INVENTORY: Drag a piece of cloth onto the glass. It can be used to reconstruct the phrase. INVENTORY: Drag all the pieces (EXCEPT the one with a square-like sketch) onto the glass . SOLUTION: Click, hold and drag the 7 pieces around till they fit into each other. Pieces that are in place will lock-in and become bright. The words are not all in the same direction. 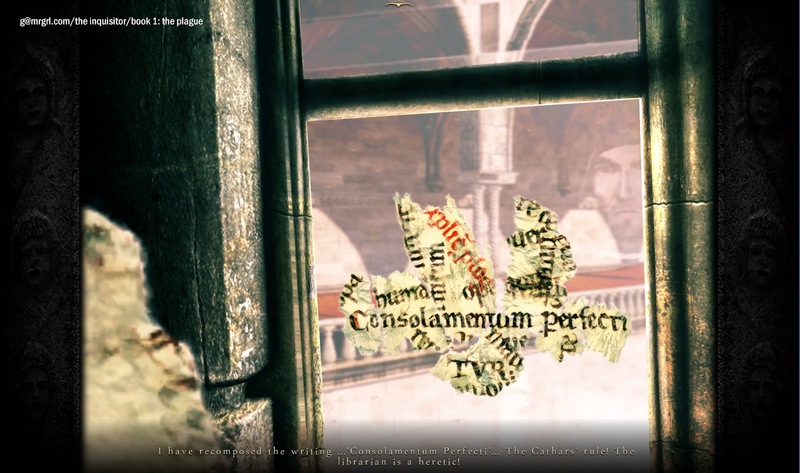 The final word formed is 'Consolamentum perfecti'. 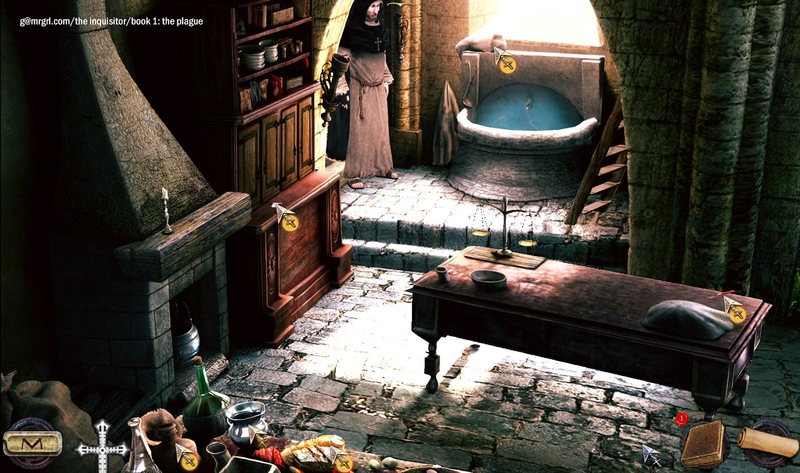 Sometimes a piece may get hidden under locked-in pieces; click around till Eymerich says the puzzle is solved. NEW OBJECTIVE: Confront the librarian. EXIT to the corridor. WALK to the librarian's cell. TALK to the librarian. Watch the action. NEW OBJECTIVE: Tie up the librarian. EXIT to the corridor. WALK to the colonnade. TAKE a piece of the tapestry hanging at right. 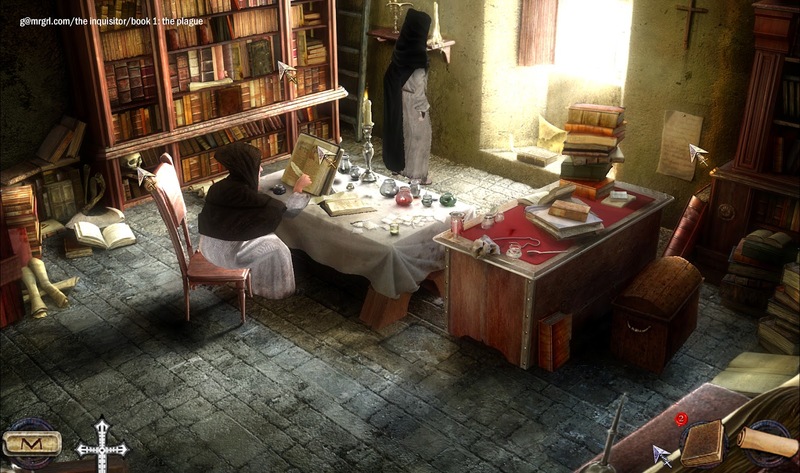 RETURN to the librarian's cell. INVENTORY: Use the tapestry with the librarian. Eymerich automatically uses the rope as well. The librarian is out of commission. EASTER EGG: KICK the librarian 3 times, till his ribs crack. NEW OBJECTIVE: Get the key to the Secret Library from Vinet. EXIT to the corridor. 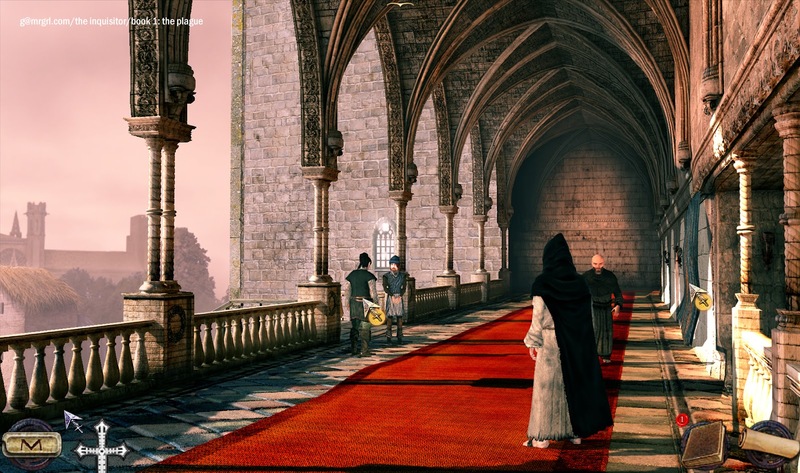 TELEPORT to the main corridor outside the Abbot's office. USE CLOSE UP VIEW on the guard. INVENTORY: Give the wine to the guard. TALK to the guard. He wants more wine. TALK to the guard again, till he takes off his helmet. NEW OBJECTIVE: Get the guard drunk. USE CLOSE UP VIEW on the closed hatch at the front bottom of screen. 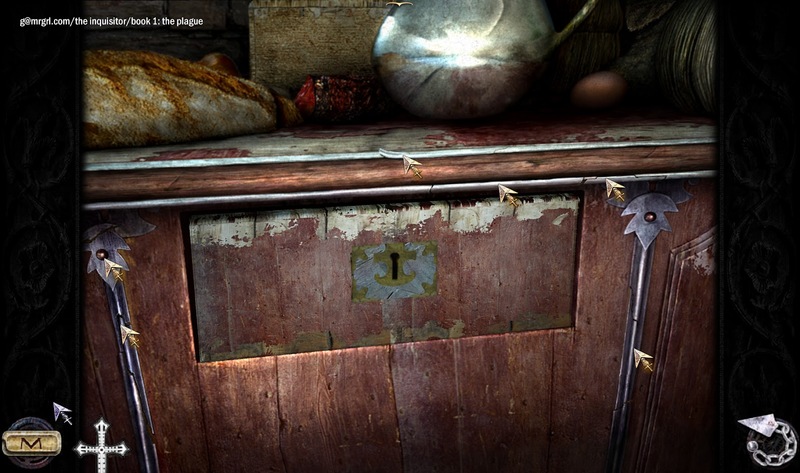 (The closed hatch hotspot is at the right of the bread). 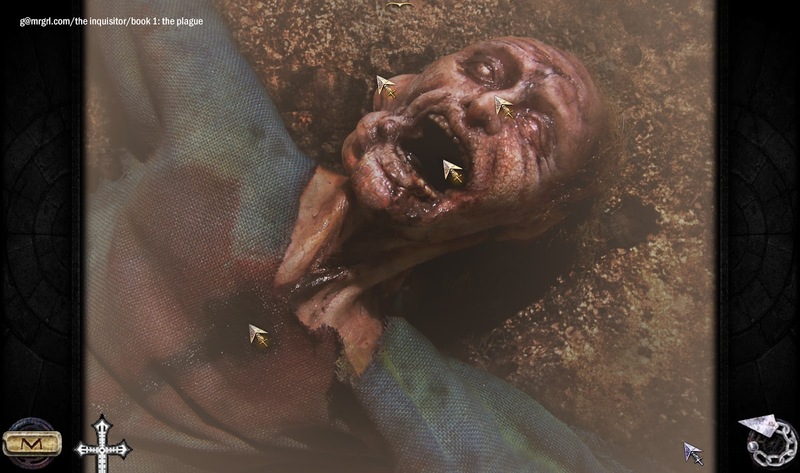 Eymerich has to unlock the hatch. Opening the drawer is a timed segment. Also, the sequence of activities to open it changes from attempt to attempt. Only 3 of the 4 activities available on clicking the drawer are required. If you run out of time or choose the wrong sequence, wait for the drawer to reset, then try again. My successful sequence was: MOVE, PUSH, PULL. Once the sequence is complete, use one of the metal parts from the collection to open the drawer. For my drawer, the metal part was #4 from the left. TAKE the bottle of poison and the antidote. NEW OBJECTIVE: Coerce the guard to hand over the keys to the Secret Library. TELEPORT to the main corridor. USE CLOSE UP VIEW on the guard's clothes. INVENTORY: Use the poison with the pendant of Baphomet. TALK to the guard, twice. The key to the Secret Library is added to the inventory. NEW OBJECTIVE: Dispose of the guard's body. USE CLOSE UP VIEW on the hatch below the window at the left of the larder. INVENTORY: Use the knife with the lime scale on the wall. Left click and hold the knife and scrape the area till the mechanism is exposed. INVENTORY: Use the triangular metal part with the triangular hole in the lock. INVENTORY: Use the hexagonal metal part with the hexagonal hole in the lock. INVENTORY: Use the handle metal part with the rod of the lock. TURN the bolt head the of key. CLICK the bolt to move it to the left. CLICK the metal block to move it down. TELEPORT to Eymerich's cell - outside. WALK to the end of the dark corridor, past Eymerich's cell. The Secret Library has a top-down view. 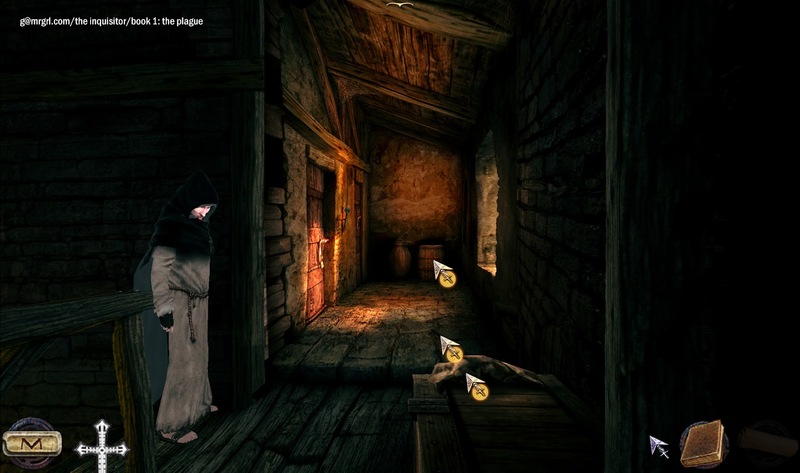 5 minigames (altars) must be solved in a particular order to access the door. The altar to be solved next can be viewed in CLOSE UP. You may get physically stuck in some parts of the maze so SAVE before starting. TAKE the candle beside the staircase. WALK to ALTAR #1, at bottom middle of the maze. 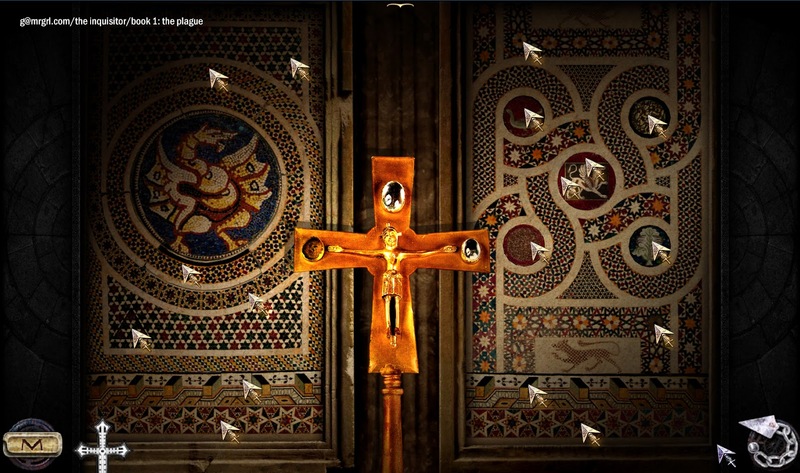 SOLUTION: 17 parts of the mosaic must be clicked to make the crucifix swing to the right. This is a trial-and-error / pixel-hunting puzzle with no shortcuts. Clicking on the dragon at left resets the puzzle. Once the crucifix is totally skewed, CLICK it to activate the mechanism. WALK to ALTAR #2, at the centre of the maze. 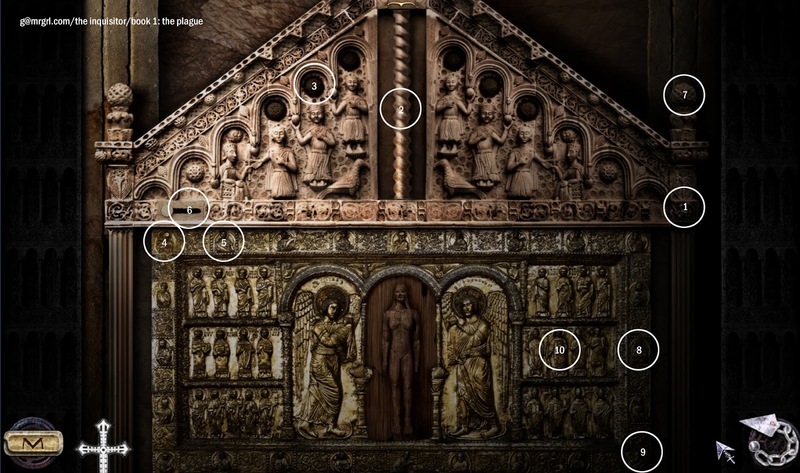 SOLUTION: 10 parts of the bas-relief have to be clicked in sequence to open the door. This is a trial-and-error / pixel-hunting puzzle with no shortcuts. Clicking the section at top-middle out of order resets the puzzle (it is the 10th part). TAKE the green gem at the right of the altar. WALK to the ALTAR #3, the Lion's Head wall, at top-right of maze. 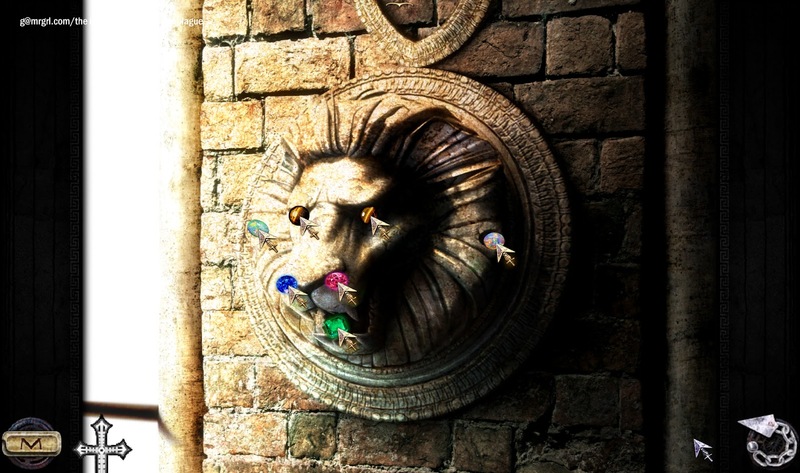 Remember the lion's head decoration in the main corridor? USE CLOSE UP VIEW on the lion's head. SOLUTION: The 7 gems have to be fitted into the lion's head. Again, a trial and error process. Any sequence is fine. WALK to ALTAR #4, at bottom left of the maze. 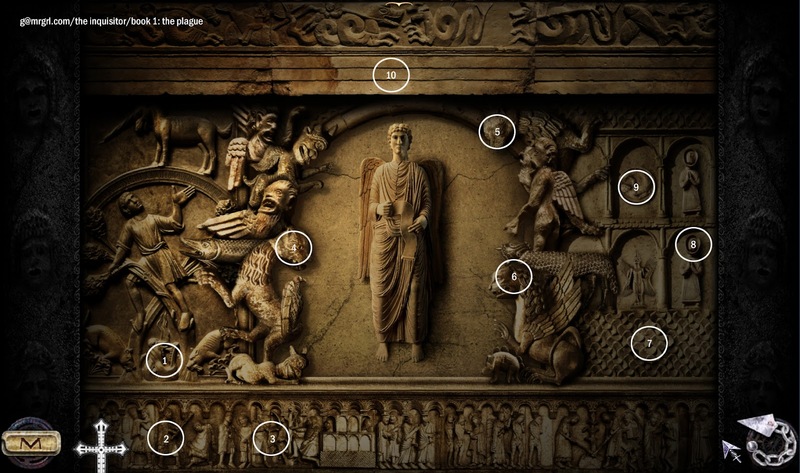 SOLUTION: 10 parts of the bas-relief have to be clicked in sequence to yield the lady's clothes. This is a trial-and-error / pixel-hunting puzzle with no shortcuts. Clicking wrong sections resets the minigame. Once the dress is revealed, USE it with the naked lady to activate the mechanism. WALK to ALTAR #5, at top centre. 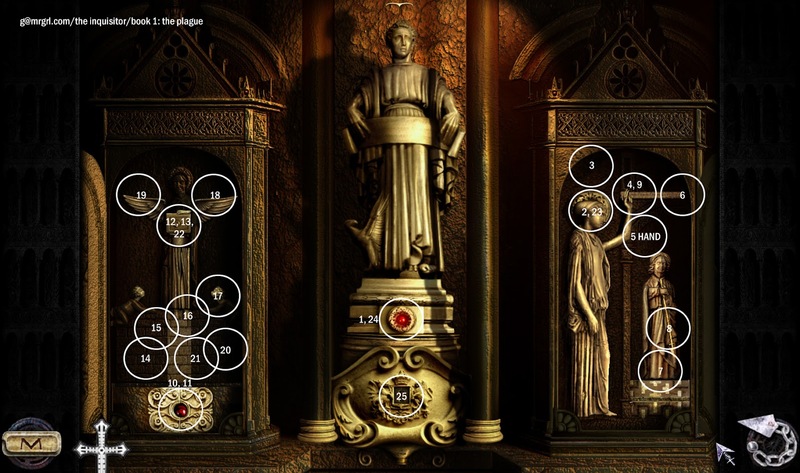 SOLUTION: 25 parts of the statues have to be clicked in sequence to open the door. This is a trial-and-error / pixel-hunting puzzle with no shortcuts. Clicking wrong sections resets the minigame. The solution screenshot marks areas where changes happen on clicking buttons. Some areas must be clicked more than once as new features appear there. ENTER the Secret Library via Altar #5. NEW OBJECTIVE: Find Homer's book in the Secret Library. INVENTORY: Use the antiphonary and copy of antiphonary with the brazier. The fire is lit automatically. WALK to the left of the brazier. TAKE red ink from the grate. 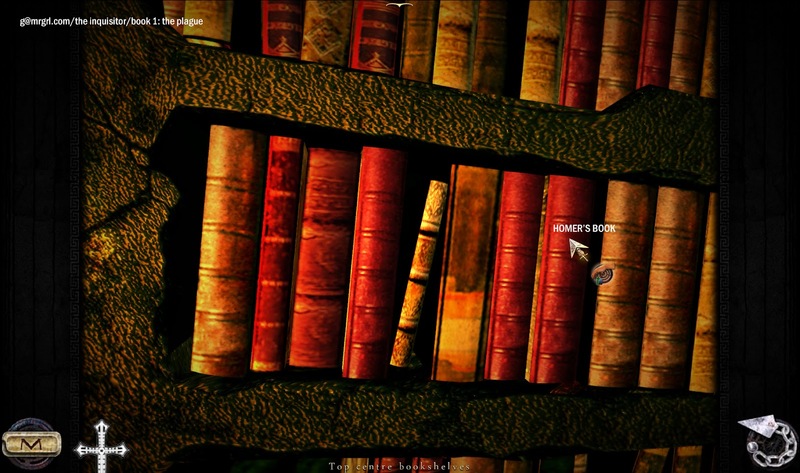 EASTER EGG: CLICK the book under the left-most arch of the staircase at the back: a yellow rose. | Screenshot. WALK up to the top floor of the library using stairs at the back. Homer's Euleusinian Mysteries is in the top centre bookshelf. | Screenshot. 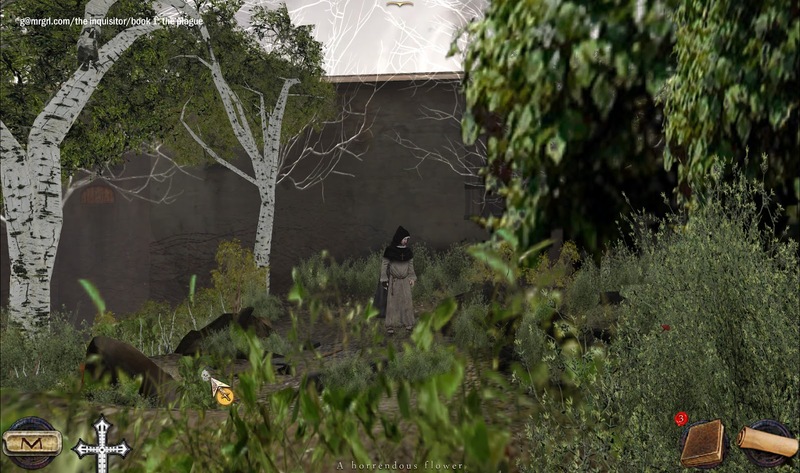 CLICK, HOLD & DRAG to the left 4 pages of the book to get to the story about Demeter. TELEPORT to the central courtyard. LOOK at the swirling dark clouds in the sky. Eymerich needs a talisman catalyst to get a vision of Diana. The formula for the talisman is on the LAST PAGE of his notes. Eymerich needs: a mushroom, a flower, a lichen, a leaf of a poisonous herb, and an acorn. WALK to the alley at the rear right of the central courtyard. | Screenshot 1 | Screenshot 2. TAKE a red mushroom from the ground. LOOK at the lichen on the wooden beam of the right-side hut. From just below the beam on the ground, TAKE the lichen (cannot see on-screen). EXIT to the central courtyard. EXIT via rear left to the stables. TAKE a leaf of the bright green plant growing on the wall right of the stable. LOOK at the squirrel on the roof of the hut. LOOK at the acorn in its hands. NEW OBJECTIVE: Capture the squirrel, take the acorn. BREAK the wooden gate at the left of the hut. WALK to the rear garden. NOTE the hidden area at right. Good place for a trap. WALK south to the rest of the garden. TAKE the horrendous flower from the left. | Screenshot. TAKE the walnut on the rear shelf. EXIT to the courtyard via left. TAKE the stick in the narrow lane between the two huts. LOOK at the headless statue in the middle. 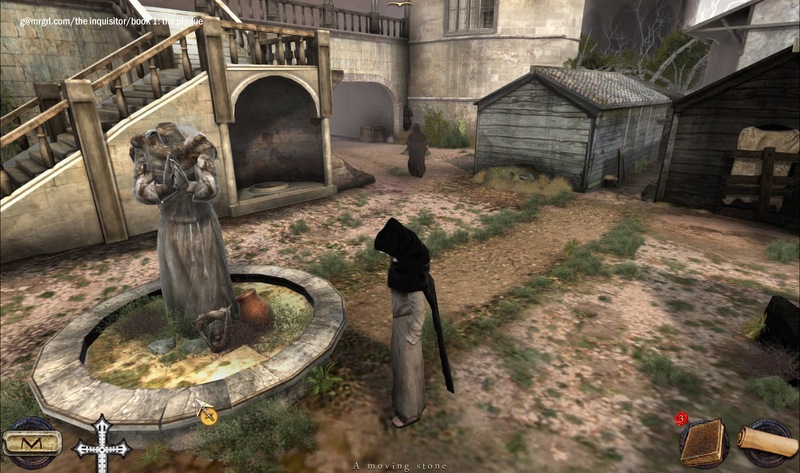 The screen zooms into the statue. TAKE the moving stone in the rim of the statue base. | Screenshot. EXIT to the rear courtyard. EXIT to the rear garden. INVENTORY: Use the stick with the stone to make the trap. INVENTORY: Use the trap with the hidden area. INVENTORY: Use the walnut with the trap. EXIT the area to give the squirrel time. Go anywhere a few random screens away. There is NO TIME INTERVAL nor any activity to before returning. This part was glitchy for me. 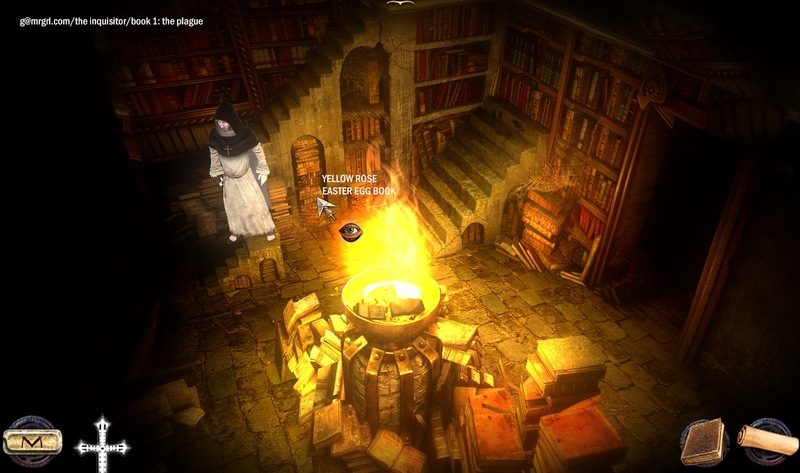 Eymerich kept saying he needs to leave the area even after doing so (even as far away as the Secret Library). Exiting the GAME, then choosing to CONTINUE removed the issue for me. RETURN to the rear garden. TAKE the acorn from the trap. INVENTORY: Combine the flower, leaf, mushroom, lichen and acorn to make the catalyst. INVENTORY: Use the talisman catalyst with the vision of Diana in the sky. TELEPORT to the main corridor. ENTER Vinet's study. 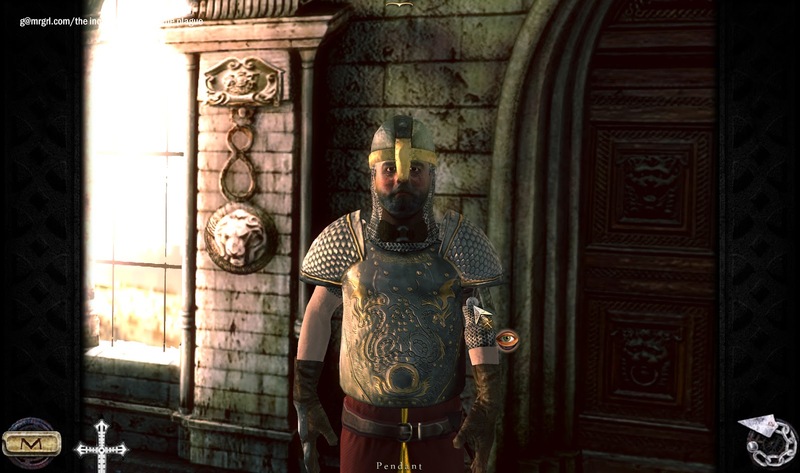 Eymerich is given the powers of the Inquisitor and Vinet's gold seal / ring. EXIT the study. TELEPORT to the stable. 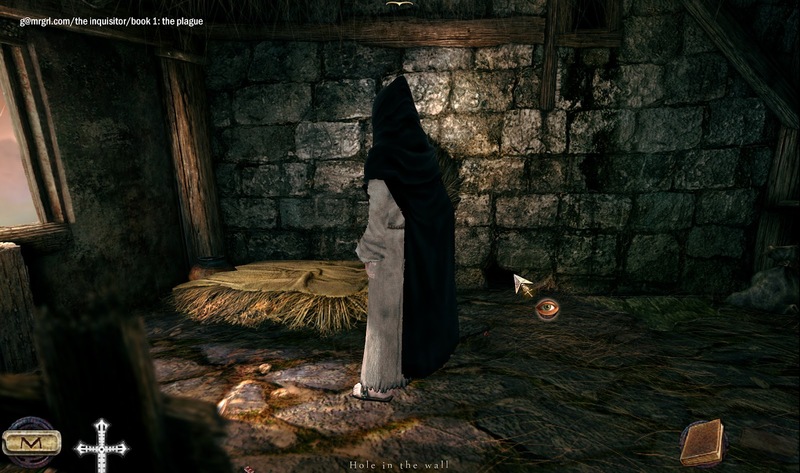 TALK to the stableman about the merchant. EXIT the gate towards Calcares. 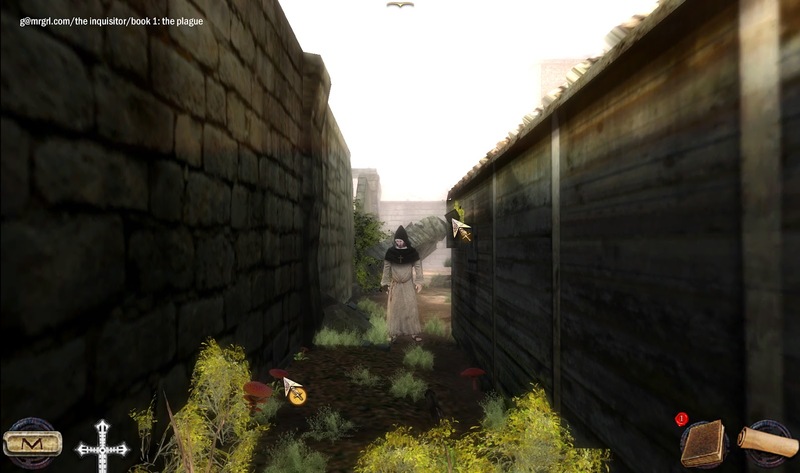 WALK to the right (the screen scrolls). USE CLOSE UP VIEW on the corpse at bottom right. | Screenshot. LOOK at the heart, mouth, flesh, pustule on left cheek. For me, the pustule hotspot is only activated after exploring the other parts. 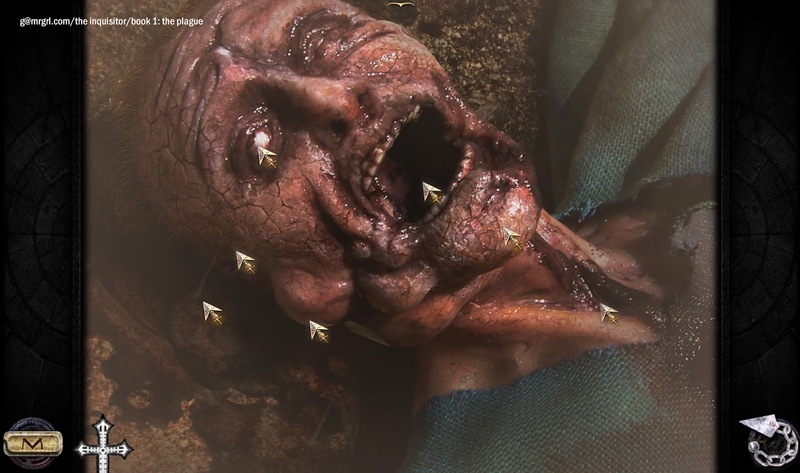 Clicking the pustule gives another view of the corpse. | Screenshot. To return to the previous view, click the heart. You cannot go to the village till you have examined the corpse fully. Eymerich will stand up once the examination is complete. EXIT to the village via the main street between the buildings. The room key is added to the inventory. GO UPSTAIRS via staircase at left. INVENTORY: Use the key with the door. LOOK at the roaches on the floor. LOOK at the hole in the wall. | Screenshot. NEW OBJECTIVE: Shut the roach hole. EXIT the room. EXIT to the inn below. TAKE the torch at the immediate right of the fireplace. INVENTORY: Use the torch with the fireplace. EXIT upstairs to the landing. Eymerich will automatically put the torch on a ring. TAKE the rag and stick from in front of the landing. INVENTORY: Use the stick with the rag. INVENTORY: Use the stick+rag with the jar of vinegar at the far end of the landing. INVENTORY: Use the vinegar-stick with the hole in the wall. STEP ON the two roaches running about. CLICK the mattress to go to sleep. NEW OBJECTIVE: Explode 4 eyeballs. WALK right for eyeballs 1, 2, 3. | Screenshot | Screenshot. WALK left for eyeball 4. Screenshot. EXIT via the flaming gate at the right of eyeball 4. WALK to the left. Take all 7 white Greek alphabets on the wall. There is one empty screen between the 5th and 6th alphabets. 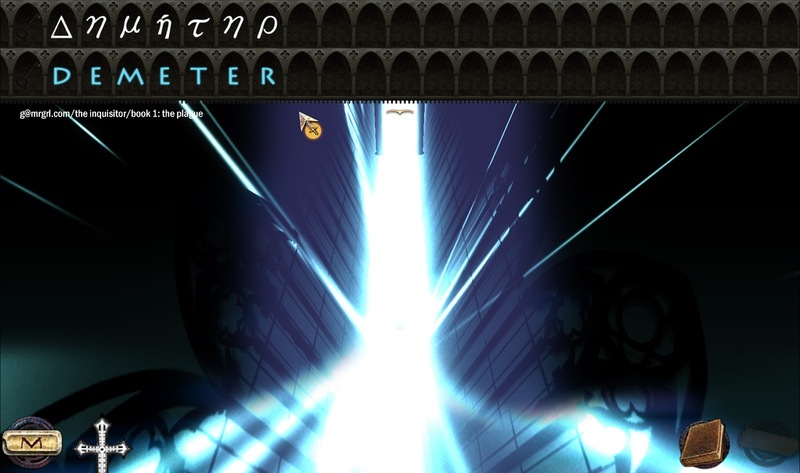 EXIT via the flaming gate at the left on the screen after the 7th alphabet. At regular intervals, Eymerich will encounter an English alphabet. From the INVENTORY, CLICK+HOLD+DRAG the corresponding Greek alphabet onto the English alphabet. 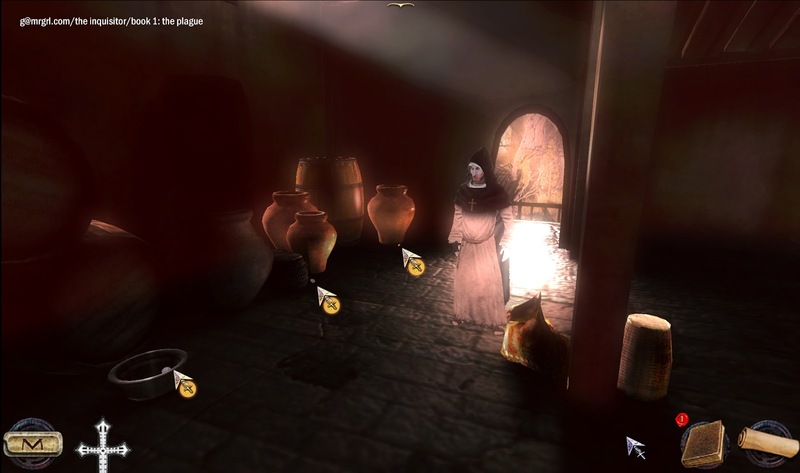 The Greek alphabets are in sequence from left to right in the inventory.